The Müritz, lovingly nicknamed "little ocean" by locals, is a dream come true for any seafarer. Not only is the area ideal for sailing and motor boating – surfers, water skiers and canoers will never get bored here either. We would like to welcome you to one of the most popular yacht harbours in the Mecklenburg Lakeland. 160 mooring places in Waren offer permanent as well as temporary guests a place to relax and wind down. The surroundings are one of a kind: innumerous lakes, green fields and wide forests. Our recommendation: Breathe deeply and let your thoughts wander! Waren is a quiet town in the heart of the Mecklenburg Lakeland. This one-of-a-kind region was formed by melting glaciers at the end of the last Ice Age, resulting in jagged landscapes and many lakes. Combined with the forests and moors, this area is like heaven on earth for any nature lover. Wide parts have also been named nature conservatories to ensure that the pristine scenery remains protected for future generations. The Müritz, the largest German lake, is surrounded by the largest park in Germany, the Müritz National Park. Another Natural Park, the "Nossentiner Schwinzer Heath" is situated in the North-West of Waren as well. 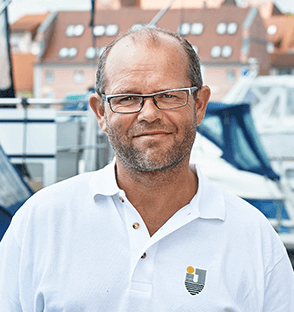 You don't even need your own vessel to explore the area by water, as several shipping companies offer tours on the Müritz and the surrounding lakes. Tourists can also book day trips to the nearby cities Rheinsburg or Plau am See or enjoy tours through the National Park by bike or on foot. One thing is for certain: Anyone can have a good time in this unique part of Germany. In the heart of the Mecklenburg Lake District in Waren you can ideally discover the "Little Sea", the Müritz.